Learn how to make one of the most popular meriendas for Filipinos---siopao. 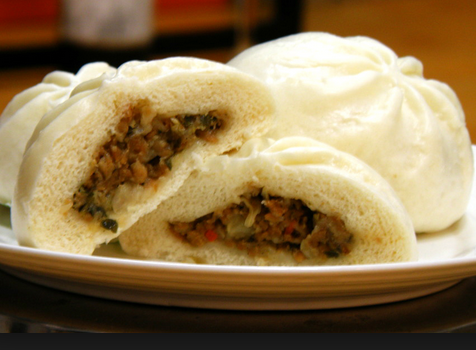 <>Siopao, or steamed pork buns, is among the most popular snacks that are readily available in most convenience stores, a few fast food chains, and several specialty food stalls. It is obviously the Pinoy spinoff of Cantonese char siu bao, a type of steamed bun that is filled with barbecued pork. 2. Prepare the dough while cooking the filling. Strain the fl our on a clean tabletop, clear its center, and into which pour 500 grams of water. Dissolve salt and white sugar in water, then add yeast. 3. Making sure that your hands are clean, knead the dough manually, or use a mixer if you have one. Knead and pound the dough for 20 minutes using the heel of your palm, applying strong pressure. Once you can form dough balls consistently, add the baking powder. Knead the dough continuously until its surface becomes fine and smooth. Add the shortening. To know if the dough is ready, cut a piece and make a dent in the middle. The dough is ready if it springs back. Remember, the dough has to be white, elastic, and very fine. 4. To make siopao, cut the dough into 30- or 60-gram pieces. Shape them into small round balls, then flatten them to give space for the fillings. 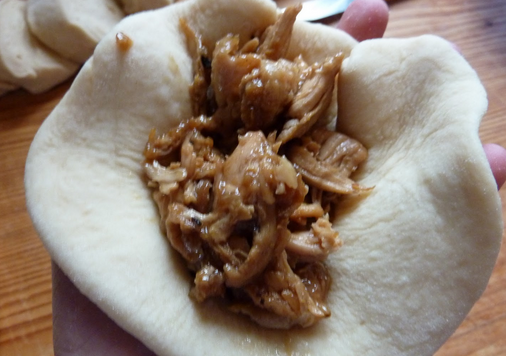 Put a tablespoon of the asado filling into each ball. Seal the dough by holding on to the edges and twisting them with your fingers. Put a small piece of bond paper (about 2 x2 inches) at the bottom then arrange the dough in baking trays. Don’t expose the dough in open air to keep its surface from drying out. 5. Put the dough in the refrigerator for 40 minutes for what is called the final proofing – the process that would make the dough rise to prevent it from breaking and wrinkling after it’s cooked. 6. When the dough has expanded, arrange them in a steamer, putting a space of an inch between each piece. Cover the dough with either clear plastic or a piece of cloth to prevent water from dripping and leaving watermarks on the dough’s surface. Make sure there’s boiling water in the steamer before you put the dough for steaming. Let the dough steam for 25 minutes. Refrain from lifting the pan’s lid often. 7. You can prepare the sauce while waiting for the dough to cook. Start by pre-mixing cornstarch (1/4 cup plus one tablespoon) with the chicken broth (1/2 cup, preferably from boiling chicken meat for the asado filling), then dissolve the brown sugar (1/3 cup) in water (1 cup). In a pan, pour all the ingredients: 1/2 cup of water, 1/3 cup of brown sugar, 1/4 cup of soy sauce, and 3 cloves of chopped garlic. Put over a stove on medium heat, continuously stirring the mixture until it boils. 8. Wait for the mixture to thicken before adding the cornstarch mix. Continue stirring the sauce in low fire until the color turns from light brown to black. Remove from fire and let cool before apportioning into small ice candy plastic bags. About a tablespoon will do to flavor a piece of siopao.